HomeBlogThe BibleWhat Is Your Path? As Jesus wraps up his stint on earth, he spends some time with his disciples, the core group he trained for three years. They will need to carry on without him, and he wants to make sure they’re ready. Then Jesus tells Peter what his future will entail. It ends with execution. 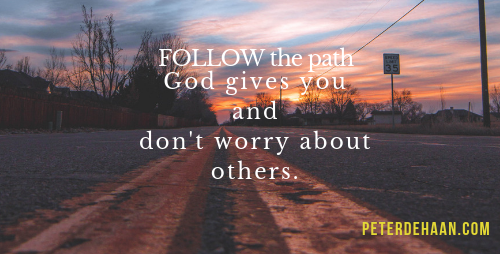 But Jesus tells Peter to follow him, regardless. Look straight ahead and follow Jesus. We shouldn’t concern ourselves with what others are doing. Isn’t it the truth that we always seem to be looking elsewhere? And comparing! In our search for validation in life, we are so prone to comparison with other people. It’s easy to forget that we already have a standard, a perfect one named Jesus. Finding who God is uniquely calling us to be and striving toward that goal will bring the affirmation that we seek in life. I love the practical nature of your posts, Peter. For us writers, the comparison game is hard to avoid. Yet, I remind myself that what matters is being faithful to what God tells me to write. Isn’t that the truth! And thank you for the referral.